When it comes to the security, storage and access benefits of external devices in today’s world, such as hard drives and flash drives, their weaknesses couldn’t be clearer. This is because innovative online backup solutions have now revolutionized the way we incorporate and utilize data. The world can now save a great deal of time, stress, and money, when it comes to securing and accessing their personal or business-related files. External drives may allow for an increased amount of backed up data to become mobile in the physical sense, but their shortcomings far outweigh their advantages. For instance, since a user is responsible for protecting their data in physical form, there is always the risk of these devices being stolen, lost or damaged. Since they’re not designed to last forever, hard drive failure is also a common threat to a user’s data. Online backup, on the other hand, which lets users backup their files via an internet connection to a highly secure offsite data center, has an endless list of benefits. Take MyPC Backup, for example; not only can you backup a whole range of devices, such as PCs, Macs, smartphones, notebooks and tablets—and access these files anywhere, anytime—your files are protected 24/7 by bank-grade security, data center monitors, and mirroring technology. What if you’re considering adopting an online backup solution but already have a whole load of data stored on an external drive, though? Well that’s no problem at all! Just like your PC, it can be backed up in no time. The following guide below will prove just how simple the process is. There are two main ways you can backup an external drive: Automated Scheduled and Drag & Drop. Before you can get started with either of these methods below, you will have to create a MyPC Backup account. Our FREE online backup trial takes just a minute to install and get running. 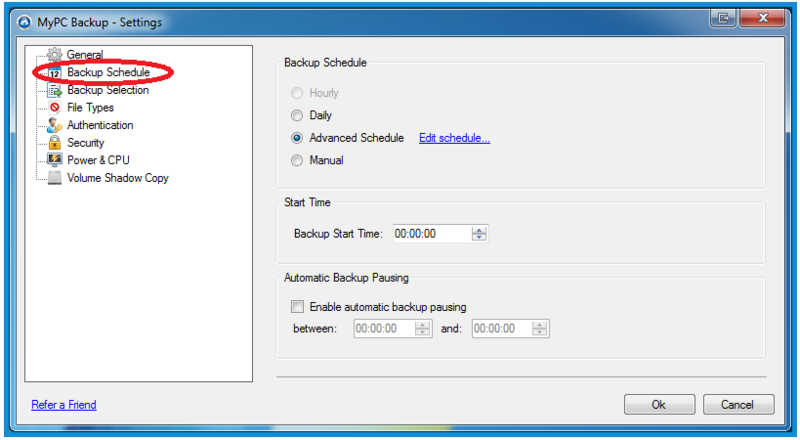 Open the MyPC Backup Desktop App, click ‘Settings’, ‘Manual Selection’, ‘Backup Selection’, followed by ‘Edit Selection’. You can now either tick the external drive, listed in this tutorial as ‘E:’ (note: for Mac users, click VOLUMES), to backup the entire contents, or alternatively, expand the contents using the ‘+’ icon and then individually tick specific folders/files. Finally, click ‘OK’ to save the selection (note: since you’re doing a Manual Selection, if you had default backup settings—i.e. 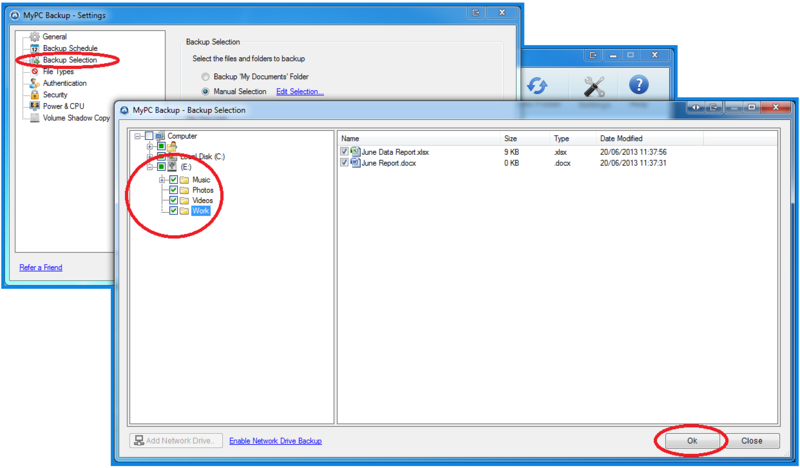 the My Documents folder—selected prior, you should ensure this folder is now also selected). Your external drive will be backed up when your next automated scheduled backup commences; of course, you must ensure your device is connected when this time approaches. Remember, your backup schedule can be managed by clicking the ‘Backup Schedule’ tab from the Desktop App. Once backed up, you can access and manage these folders/files via your control panel on our website. Just sign in, select a device from the ‘My Device’ shortcut menu on the left, such as ‘New PC’ shown here, click ‘View My Files’, and then select a drive, such as ‘E:’ here; you can now browse through folders and files, of which can be downloaded (multiple versions can be chosen from), previewed, shared, or deleted. If, on the other hand, you’d rather simply backup a few single files, you can always choose this method. 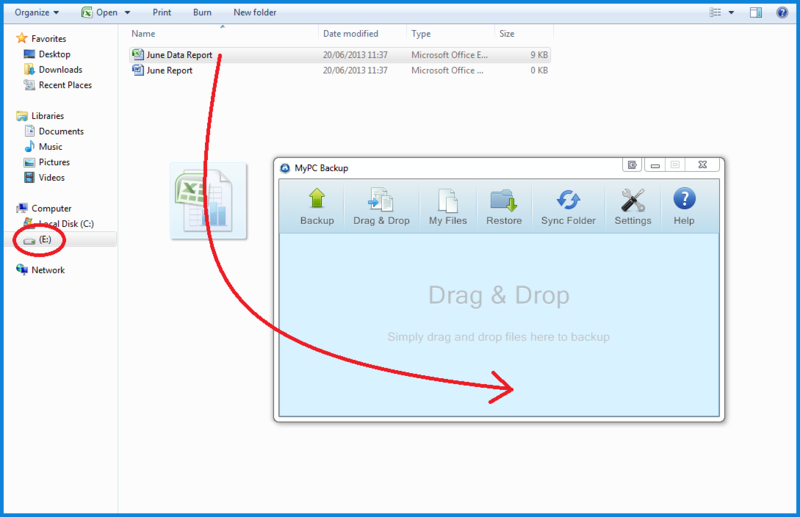 Open up ‘My Computer’ so you can see all your computer’s drives, locate your external drive, such as ‘E:’ shown here, and open up the MyPC Backup Desktop App and click the ‘Drag & Drop’ tab. Hold down the ‘left’ mouse button, drag the file of your choosing into the app, and let go. The file will now be backed up to your account. And there you have it. Easy external drive backup. Easy stuff! If you’re not yet a MyPC Backup customer, feel free to stick around and check out our acclaimed features and services. Whether you’re looking for Personal Backup, Business Backup, or are even looking to become an Online Backup Reseller, we’ve got the perfect plan for you.